Spitfire Audio’s Olafur Arnalds Chamber Evolutions – what is it? 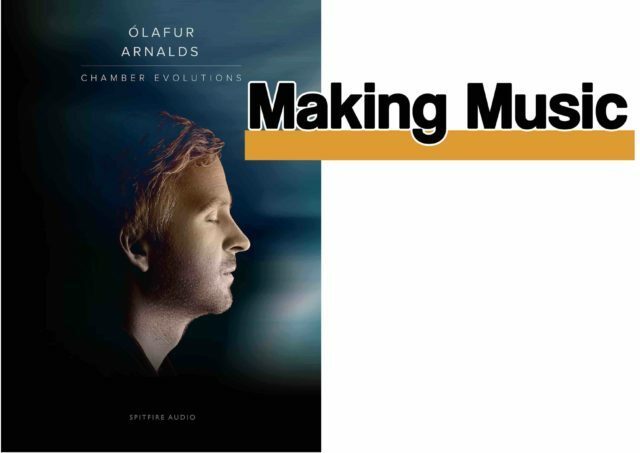 Olafur Arnalds Chamber Evolutions (OA Chamber Evolutions from now on) applies Spitfire’s Evo Grid technology to a chamber orchestra comprising 4 Violin Is, 3 Violin IIs, 3 Violas, 3 Cellos and 3 Double Basses. Evo stands for Evolution and the sounds are designed to evolve over time. The result is a vast range of slowly-evolving notes and textures. Olafur Arnalds describes it as “a sample you can play for three minutes that’ll never sound the same”. 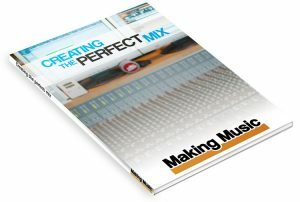 It runs in the free and paid-for Kontakt version 5.6.8 or higher. Windows users need Windows 7 or higher. Mac users need OS X 10.10 or later. It needs 30.5Gb for installation which reduces to 19.4Gb after removing the installation files. 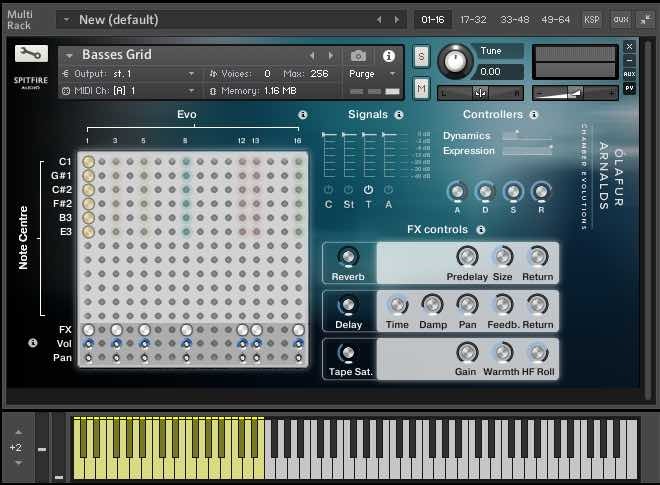 There are four main instruments – Basses Grid, Basses Waves, Chamber Grid and Chamber Waves. Spitfire has released several libraries that use the Evo Grid engine. It has a VCS3-like (for anyone who remembers the seminal EMS VCS3 analogue synth) plug-board interface. The Y or vertical axis holds the key ranges and each one covers a perfect fourth so G#2, for example, includes the notes from F#2-B2. The horizontal or X axis holds the Evos which are numbered across the top of the grid. To apply Evo 4 to the key range G#2 you simply click at their junction to insert or remove a peg. You can give each key range a different Evo to create an almost-limitless number of variations right across the keyboard. It’s simply a very long sample, up to a minute, which evolves – the clue’s in the name – and change as it progress. For example, one might start quietly, rise to a crescendo then fade. Another might do the same but at a different speed. Another might have an element of tremolo in it. Another might evolve into harmonics. Another might have a pulsating or a flutter effect. And so on. There are several different Evo types including subtle, thrills, episodic and dissonant. They are arranged by coloured pegs across the grid from left to right so you can see when you look at the board which type of Evo is being applied. Because Evos can evolve at different speeds, if you play more than one they undulate against each other as they develop. 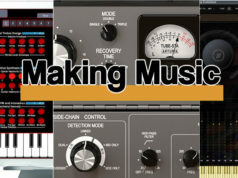 You can literally hold down a few keys and create a super-long, ever-changing cue that would fit into many scenes. In fact, Olafur did the music for the TV series Broadchurch so if you watched that you’ll notice that much of his style is very like the sounds you can get from this library. You can hear excerpts on YouTube. If you don’t want to be methodical about it, you can click the Dice button in the Chamber Grid which randomises the pegs. As well as doing a total randomisation (the number of combinations here is in the trillions), you can randomise columns to keep a more uniform arrangement across the key range. 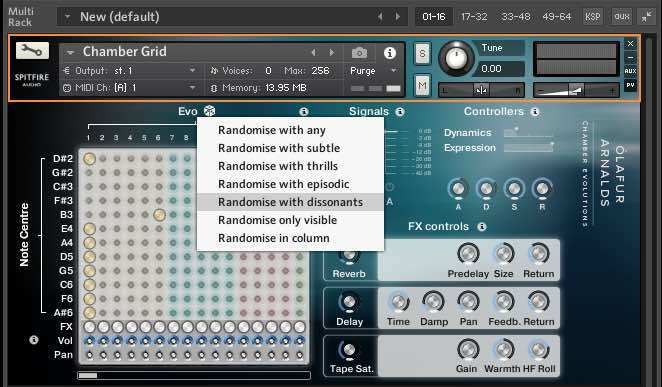 You can also randomise according to the Evo type (see above) so if you want a particular type of sound, this helps you home in on it. The Chamber Grid has 19 Evos while the Basses Grid only has 7 and lacks the Dice function which seems a strange omission. OA Chamber Evolutions has four different Mic positions – Close, Stereo, Tree and Ambient. You can switch them on and off and adjust their relative levels to further tailor your sound. You can also route each Mic to a different output which will be particularly useful if you’re working in surround sound. Expression and Dynamic controls can be adjusted with MIDI Controllers so you can change them in real time or automate them. There are ADSR controls and FX Volume and Pan plugs, too, with separate Reverb, Delay and Tape Saturation controls. The FX were chosen because they work extremely well with string sounds and if you add them to the mix the range of possible textures runs well off the scale. One of Olafur’s ‘signature’ sounds is a crescendo-decrescendo. 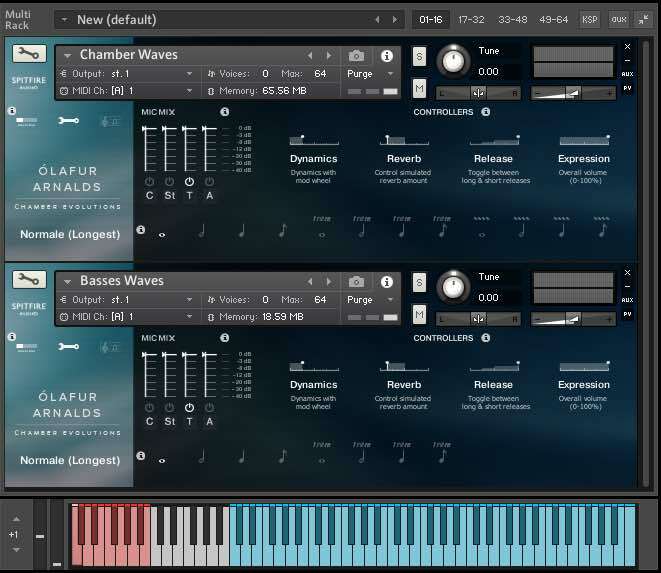 In other libraries you would create these with a fader or by drawing curves in your DAW but OA Chamber Evolutions comes with a selection pre-recorded called Waves which are where the Basses Waves and Chamber Waves instruments come in. They use Spitfire’s standard interface with three types of articulation – normale (legato), tremolo and vibrato – each with four lengths – longest, long, short and shortest. You can select these on the interface or via key switches. As per the standard interface there are Dynamics, Reverb, Release and Expression sliders plus additional controls in the Advanced section for round robin adjustments. Another interesting feature from Olafur is feathering. This is a process used during recording whereby only half the players are used at any one time which helps preserve the detail of individual players when playing chords. You get the full effect of the articulations but the sound is not too dense. As well as the four main instruments, there are more in sub folders. 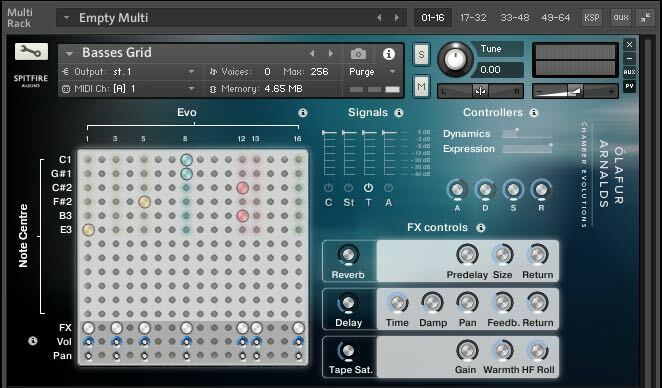 Individual Evolutions, as you might expect, holds individual instruments which is useful if you like to create a single articulation in each Kontakt instance. Another folder holds individual Waves instruments while an Other Patches folder holds TM (Time Machine) instruments which sync to the tempo of your DAW. 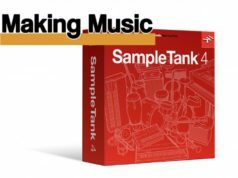 Of course, you can mix and match any of these instruments simply by loading two or more into Kontakt and setting them to the same MIDI channel. One obvious option is to combine the Chamber and Basses Waves. Another is to combine two or more Chamber or Basses articulations, say a long Evo and a tremolo, and see how they weave in and out of each other. The possibilities are many. As you’d expect from Spitfire, the recordings and programming in OA Chamber Evolutions are top quality and first-rate. 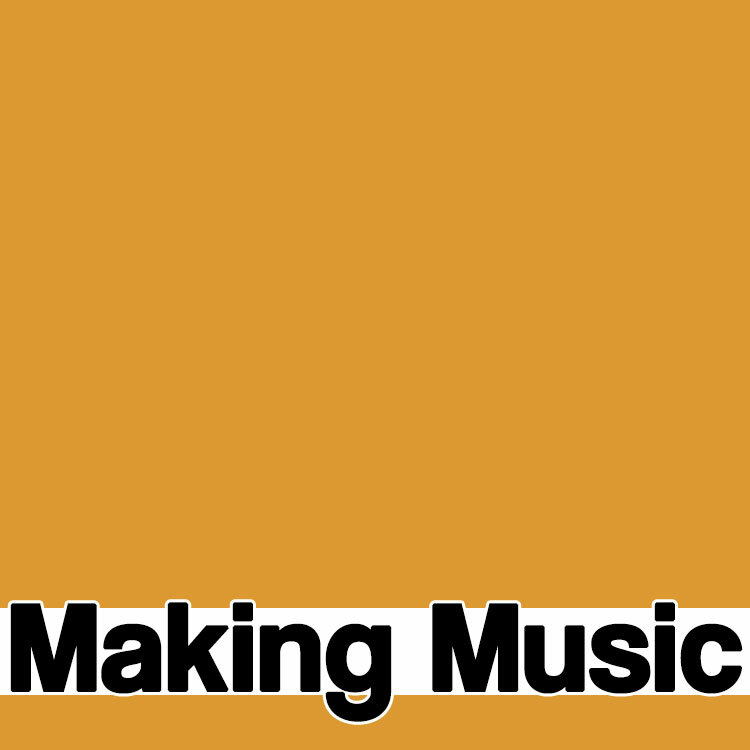 The samples, articulations and mixes create a wide range of intricate, evolving textures. The articulations are not those you will readily find in other sample libraries and the result is something that would be very difficult, if not impossible, to create elsewhere and which actually does sound as though it is being played by live musicians. The samples were recorded in Air Studios, London, which is where Spitfire records many of their libraries so OA Chamber Evolutions fits in very well with other Spitfire libraries such as Albion ONE. In fact, an easy way to add a little more interest or sense of realism to an existing string arrangement is to add a dash of OA Chamber Evolutions. Another really cool thing about the library is that you can create a whole cue just by pressing a few keys and playing a few chords. And the sound is absolutely wonderful. In fact, it’s one of those instruments which inspire you to play and compose at the same time. This is not for creating ostinato lines or fast, flashy passages but if you want textured, expressive, Icelandic chill, intimate string lines it’s absolutely perfect.